It’s hard to drive or walk through the streets of Richmond and find a yard that doesn’t have an azalea growing in it’s midst. But this southern landscape staple has developed a few new tricks. That azalea growing in the shady spot of your grandmother’s back yard is most likely the variety we’re all most familiar with. Once a year, in the spring, it would fill with color. Eventually that color would fade and we’d have to wait another year for the show to come around again. While the traditional, spring blooming azalea boasts some of our favorite colorful varieties, and it’s hardiness tried and tested, we can now enjoy Azalea color in three seasons, and in the bright sun! With the advent of Encore (full-sun, spring and summer or fall blooming) Bloom-a-thon, and ReBLOOM (both shade, repeat bloomers spring, summer, and fall) azaleas, that familiar blast of color that signified the beginning of spring for so many of us is a lot less fleeting and a lot more bright. Southern Indica azaleas. Large flowers and large leaves. Blooming in late March and into early April. Tall, upright growers, some reaching 7-10 feet. Formosa (magenta), Mrs. G.G. 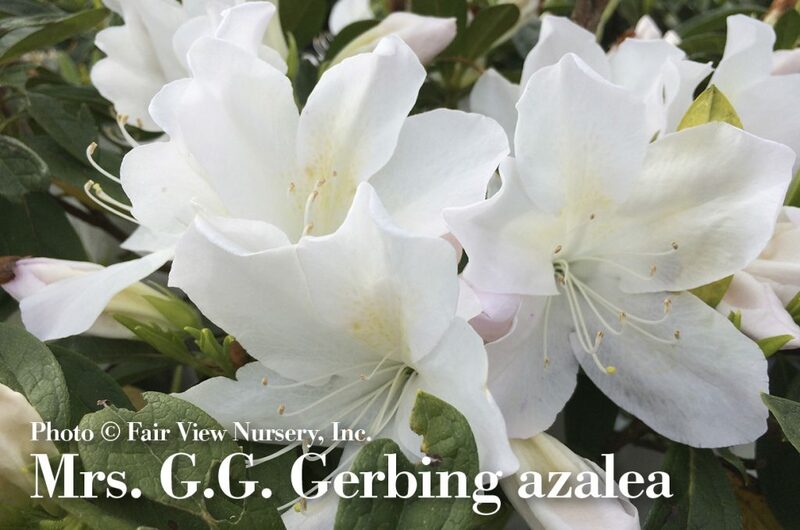 Gerbing (pure white), and George L. Tabor (pale pink) are popular varieties of Southern Indica azaleas. Kurume azaleas are compact growers, getting as wide as they are tall. Dense bloomers from late March to mid-April. Popular varieties are Coral Bells (salmon), Hinodegiri (deep red), and Snow (white). Prune and fertilize your spring bloomers after the blooms fade in the spring. 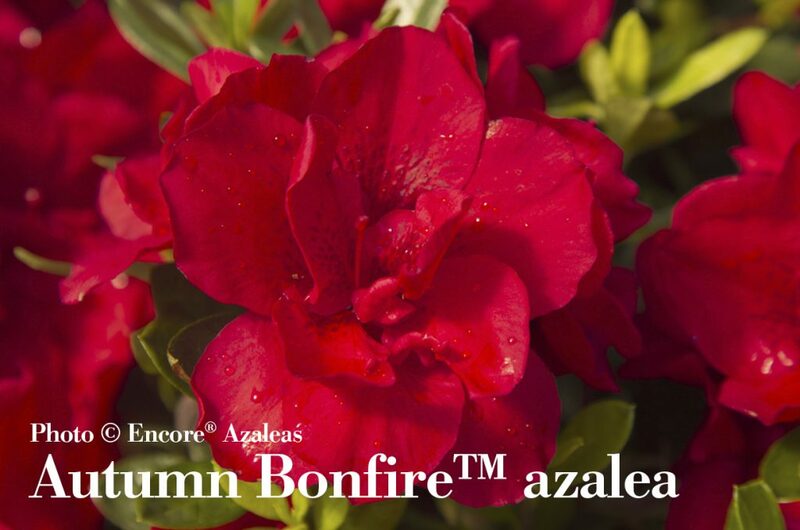 Encore azaleas will bloom in full-sun, making them the only group to be truly at home there. Sizes range from dwarf, 2-3 feet tall, and include Autumn Angel (white), Autumn Bonfie (red) and Autumn Chiffon (white with pink throat), to intermediate size, 4-5 feet tall. Varieties in this size range would include, Autumn Amethyst (fuschia), Autumn Empress (hot pink), and Autumn Moonlight (clear white). 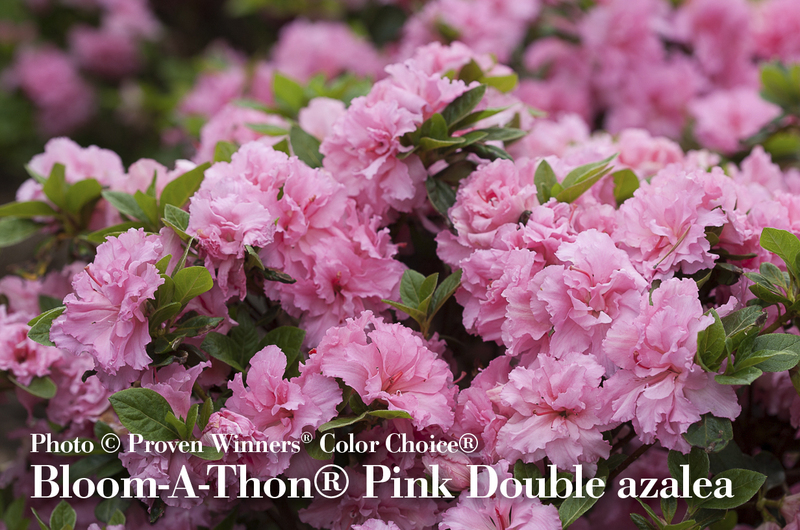 Bloom-a-thon are repeat-blooming, shade azaleas, blooming in spring, summer, and fall. Try Pink Double for a plant packed with large, double (you guessed it, pink) blooms. ReBLOOM is another repeat-blooming, shade azalea. These very cold hardy (0 to -10) plants will bloom spring, late summer and fall. Purple Spectacular is a compact specimen with brilliant purple blooms. Exbury azaleas are hybrid deciduous azaleas. Primarily bred in England, all these varieties have one or more native azaleas as parents. Though blooming only once, these varieties offer a distinct variations in bloom shape and color. 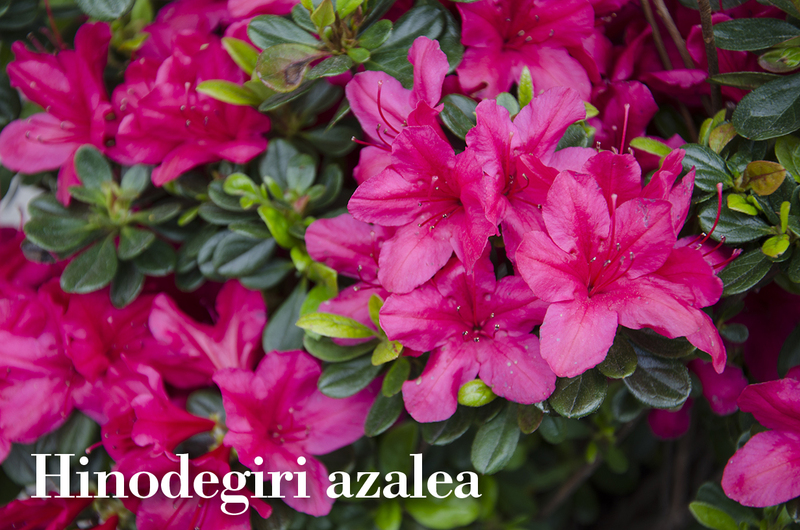 With more pastel and multi-colored blooms, this azalea offers a more wild and exotic look. Try Cannons Double. We are proud to carry the following azaleas for our spring 2018 season! « It’s Time to Plant Cool Weather Vegetable Crops!